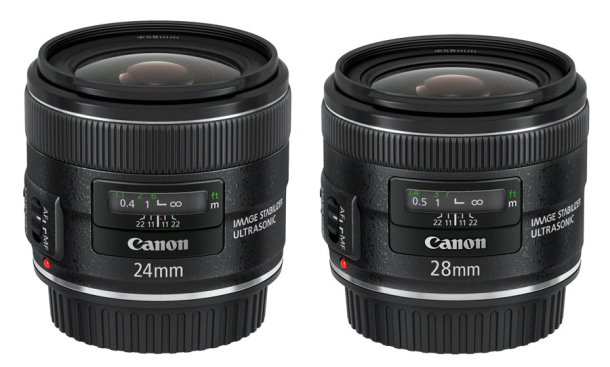 Canon announced the introduction of three new lenses in the 24 to 70mm range a few months ago. The Canon 24-70mm f/2.8 L II has a list price of $2,300 and replaces the Canon 24-70mm f/2.8 L lens. The other two lenses, 24mm f/2.8 IS and 28mm f/2.8 IS are new introduction and are not replacing any particular lens in their EF lens lineup and list for $850 and $800 respectively. I have owned the Canon 24-70mm f/2.8 L lens for many years and have not been that keen on it. The lens is a great performer. It is very sharp in the center at all focal lengths and the corners are excellent. Extending the focal length will result in a very small softness around the corners, especially at the high end of the focal length range but stepping the lens down 1 stop will make a great improvement. My complaint is with its weight and design. The lens weighs in at 33.6 oz. and uses an extended tube design with the lens protruding the most at the shortest focal length - 24mm. Many people use this lens for wedding and portrait photography. I bought it for landscape and travel but found the Canon 16-35mm f/2.8 L II lens a much more useful and pleasant model to use. It is always in my equipment bag when I go on photo shoots. 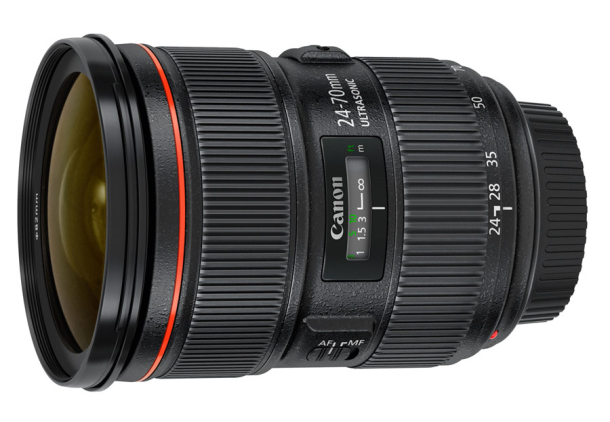 The new Canon 24-70mm f/2.8 L II is a dramatic improvement over its predecessor. It seems Canon is following its formula of recent new lens introduction by giving the new models superior optics based on new coatings and additional curved aperture blades to improve bokeh, sharpness and color balance while cutting chromatic aberration and ghosting. The new lens also has a zoom ring plus a lock at the wide end, and is a lot lighter. Its weight will be about 28.4 oz. Also Canon has decided to forego Image Stabilization on this new lens in favor of cost and lower weight. I am in favor of this decision because a high quality, fast lens of this focal length does not really need IS. I have tried a pre-production model at a photo shoot and was very impressed by its performance. My new lens should be arriving next month. 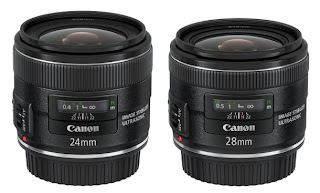 The Canon 24mm and 28mm f/2.8 lenses on the other hand are not L lens and are aiming for a wider market where Image Stabilization is almost like an expected feature. Although IS is very helpful in longer focal length lenses, making these two lenses with IS is perhaps purely a marketing decision, as evidenced by most of Canon's lower priced EF-S lenses, which all have the label IS stamped on them. Both lenses should be available for delivery some time in June and I expect them to have slightly better image quality than most EF-S lenses.